Charlottesville, Va., Nov. 9, 2017 - St. Anne's-Belfield School Kindergarten teacher Lindsay Rubin was honored with the 2017 VAIS Innovation in Education Award at this year's Virginia Association of Independent Schools (VAIS) Leading Learning Conference in Richmond, Va. on Nov. 6. The award, offered each year to a high school, middle school, and elementary teacher, focuses on finding joy in innovation and recognizes teachers who have "embraced a culture of curiosity and joy" in their educational communities, whether in classrooms, with colleagues, or both. For Rubin, a learning discovery process that she has come to call "investigations" was the topic of her application essay. 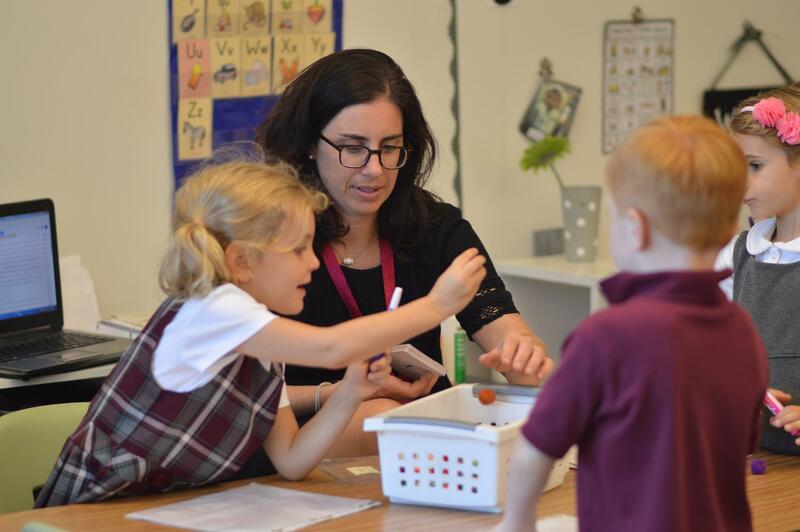 "I can tell you with absolute certainty that this process has brought curiosity and joy to the forefront of my classroom," said Rubin. "The investigation process combines some of my favorite teachings from Emergent Curriculum, inquiry-based learning, Makerspace and the design cycle, and The Project Approach." Rubin considers investigations, in which topics for research grow from the interests and needs of each class of students, as representing the most organic and meaningful form of learning. Her students' investigations have explored everything from ants to hot air balloons to games to mazes and more. "There is no single format or path that an investigation follows," noted Rubin. "The process has certainly evolved over the years. However, there is a general flow that weaves each learning journey together; an interest develops among the Kindergarteners, we begin noticing and wondering about the topic, we find ways to discover the answers to our wonders, we play and sing and paint and make things because that's how learning comes to life for little people, and at the end we reflect on and share our learning with the ultimate goal of using what we have learned to help make our community a better place." Rubin has been a teacher at St. Anne's-Belfield School's Learning Village since 2013. Prior to arriving in Charlottesville she taught in three states and completed a year-long fellowship studying Jewish education. Her teaching philosophy, from which her investigations process grew, is that children are born curious and eager to learn, so Kindergarten classrooms should value students' interests and wonders, their amazing capacity for thinking critically and learning collaboratively, their innate desire to move, touch, and explore the world around them, and their wondrous senses of creativity.